The Pope has joined Twitter. Pope Benedict XVI sent his first tweet earlier today from an iPad at the Vatican. "Dear friends," it reads, "I am pleased to get in touch with you through Twitter. Thank you for your generous response. I bless you all from my heart." 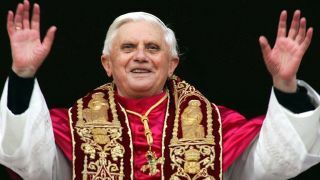 The 85-year-old pontiff was helped by a group of aides. Since the first message, he's tweeted four times. And if you were wondering who he's following, it's a little disappointing. He's only following his different language accounts. So you won't see him exchanging views with any other high-profile tweeters. Vatican spokesperson Frederico Lombardi said it was important to spread the Pope's message. "We have seen how much information and how many voices are out there and we wanted to be present and introduce a positive and religious message," he said. But don't expect the Pope to be tweeting pictures of his meals. He's "not the kind of person who will be checking his tweets at lunch," according to Greg Burke, media adviser to the Vatican's secretariat of state. Last year, the Pope encouraged young Christians to join social networks like Facebook and Twitter. "I would like then to invite Christians, confidently and with an informed and responsible creativity, to join the network of relationships which the digital era has made possible," he wrote. However, he warned of the dangers of "excessive exposure to the virtual world" and that "virtual contact cannot and must not take the place of direct human contact."